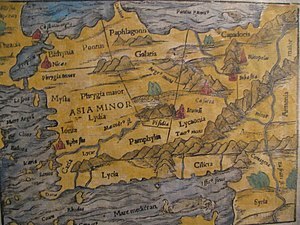 Paphlagonia was an ancient area on the Black Sea coast of north central Anatolia , situated between Bithynia to the west and Pontus to the east, and separated from Phrygia (later, Galatia) by a prolongation to the east of the Bithynian Olympus. According to Strabo, the river Parthenius formed the western limit of the region, and it was bounded on the east by the Halys river. The greater part of Paphlagonia is a rugged mountainous country, but it contains fertile valleys and produces a great abundance of hazelnuts and fruit – particularly plums, cherries and pears. The mountains are clothed with dense forests, conspicuous for the quantity of boxwood that they furnish. Hence, its coasts were occupied by Greeks from an early period. Among these, the flourishing city of Sinope , founded from Miletus about 630 BC, stood pre-eminent. Amastris , a few miles east of the Parthenius river, became important under the rule of the Macedonian monarchs; while Amisus , a colony of Sinope situated a short distance east of the Halys river (and therefore not strictly in Paphlagonia as defined by Strabo), grew to become almost a rival of its parent city. The most considerable towns of the interior were Gangra – in ancient times the capital of the Paphlagonian kings, afterwards called Germanicopolis, situated near the frontier of Galatia – and Pompeiopolis, in the valley of the Amnias river, near extensive mines of the mineral called by Strabo sandarake (red arsenic or arsenic sulfide), largely exported from Sinope. Although the Paphlagonians play scarcely any part in history, they were one of the most ancient nations of Anatolia (Iliad, ii. 851—857). In the time of the Hittites, Paphlagonia was inhabited by the Kashka people, whose exact ethnic relation to the Paphlagonians is uncertain. It seems perhaps that they were related to the people of the adjoining country, Cappadocia, who were speakers of one of the Anatolian branch of the Indo-European languages. Their language would appear, from Strabo's testimony, to have been distinctive. Paphlagonians were mentioned by Herodotus among the peoples conquered by Croesus, and they sent an important contingent to the army of Xerxes in 480 BC. Xenophon speaks of them as being governed by a prince of their own, without any reference to the neighboring satraps, a freedom perhaps due to the nature of their country, with its lofty mountain ranges and difficult passes. All these rulers appear to have borne the name Pylaimenes as a sign that they claimed descent from the chieftain of that name who figures in the Iliad as leader of the Paphlagonians. At a later period, Paphlagonia passed under the control of the Macedonian kings, and after the death of Alexander the Great, it was assigned, together with Cappadocia and Mysia, to Eumenes. However, it continued to be governed by native princes until it was absorbed by the encroaching power of Pontus. The rulers of that dynasty became masters of the greater part of Paphlagonia as early as the reign of Mithridates Ctistes (302–266 BC), but it was not until 183 BC that Pharnaces reduced the Greek city of Sinope under their control. From that time, the whole province was incorporated into the kingdom of Pontus until the fall of Mithridates (65 BC). Pompey united the coastal districts of Paphlagonia, along with the greater part of Pontus, with the Roman province of Bithynia, but left the interior of the country under the native princes, until the dynasty became extinct and the whole country was incorporated into the Roman Empire. The name was still retained by geographers, though its boundaries are not distinctly defined by the geographer Claudius Ptolemy. Paphlagonia reappeared as a separate province in the 5th century AD (Hierocles, Synecdemus c. 33).